Recently I received yet another notice from a school that is changing its name from “College” to “University.” The trend of adding a few graduate programs and offering more technical majors continues to attract some institutions known in the past for their undergraduate, liberal arts programs. But at Westmont we have no intention of becoming a university. Undergraduate education that enables students to gain basic competencies and critical thinking and communication skills remains our specialty and focus. I am convinced that our rigorous liberal arts curriculum and intentional residential program provides the competencies and personal development required for a wide range of leadership careers in a society characterized by moral ambiguity and technological change. Rather than train students for specific jobs, we help them develop skills they must use in every imaginable position. Our students learn how to analyze information, separate the valid from the invalid, make informed judgments, and clearly and persuasively communicate their conclusions. The strong and authentic Christian faith that permeates the campus provides a solid base for leadership in our increasingly secular world. During my 21-year tenure at Westmont, we have added a minimal number of majors to our curriculum. One of these is communication studies, the subject of our feature story. In keeping with our mission, the communication studies program utilizes the essential theories and concepts of communication to explore issues such as mediated communication, the nature of propaganda, and public discourse. Students learn to be effective in their personal communication with friends and family and develop the clear thinking and persuasive skills necessary for successful interaction in business and society. In the process of gaining an increased understanding of the nature and power of communication in our world, they learn how to think, speak, and write better. Writing assignments, class discussions, and close relationships between professors and students encourage the development of effective oral and written expression in all majors at Westmont. Building such skills is a by-product of the liberal arts, and I believe it is desirable to include theoretical communication studies in our curriculum. 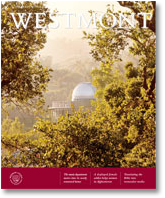 Indeed, a review of this issue of the Westmont magazine reveals the importance of clear communication in our society. Bob and Jean Svoboda (page 8), the generous donors who funded our debate tournament and essay contest, both attest to the importance of communication skills in their professional success. Ralph Moore (page 18), the parent of one of our alums, has created hundreds of rose hybrids and communicates his love for God and his passion for excellence by breeding beautiful and hearty new strains. His roses speak for him and express his creative genius in gardens throughout the world. Amy Beard ’93 (page 21) works for an international communications firm and has witnessed the tragedies that occur when communication between peoples completely breaks down. The addition of an annual debate tournament and essay contest strengthens our communication studies program, and I was delighted to see so many students take part in the inaugural competitions. This is exactly the kind of experience we want to provide. Our communication studies faculty are helping our students become critical and discerning consumers of all forms of communication, from the media to the Internet. 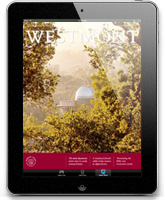 What a challenge for an undergraduate, Christian college like Westmont: to prepare bright and committed men and women to think clearly and communicate effectively in all aspects of their lives.